What a ride for Maxime Canevet. After that last double up Canevet won another hand and was up to 33 big blinds again. 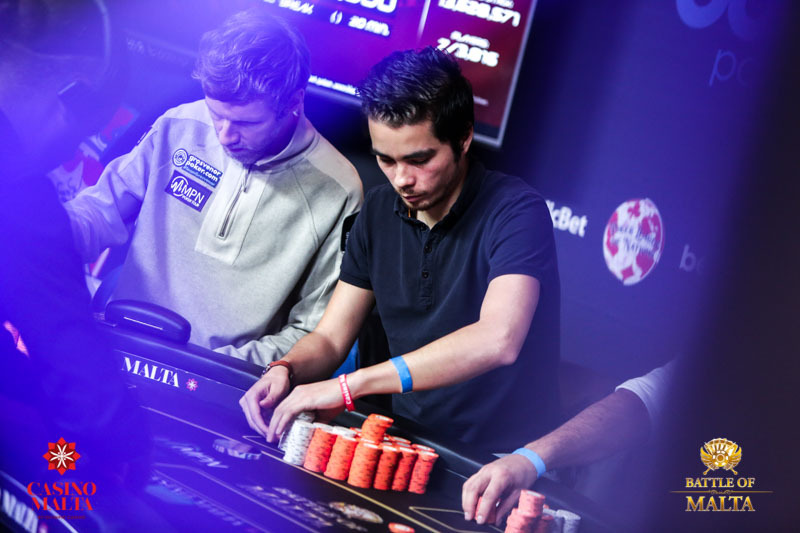 With his opponent, Julien Stropoli, on 46 big blinds the game looked completely open. But the poker gods didn’t fancy a long heads-up and delivered a nasty bad beat to end the tourney. From the button Stropoli opened with 5♣ 3♣. Canevet found K♥ K♣ in the big blind. He made it 6.6m as a 3-bet and Stropoli made the call. Canevet kept firing and made it 5.4m. Stropoli instantly called. Now Stropoli made two pair and got a huge reward for two loose calls. Canevet checked his overpair and Stropoli bet 9m. Canevet moved all-in, Stropoli instantly called. And just like that the Battle of Malta is over! Julien Stropoli is the 2018 Battle of Malta Main Event champion and takes home €168,500, which is actually less than Canevet because of the 5-handed deal. Still, both of our French finalists are heading back to their Maltese homes with heavy pockets. Allez Les Bleus!